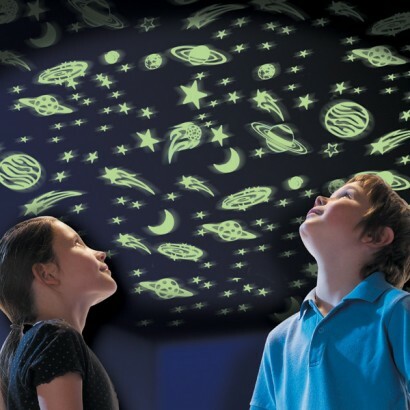 Recreate the universe in your own room with these glow in the dark shapes, Glow Superstars includes over 500 different space shapes such as stars, planets, meteorites, moons, UFOs and rockets. Educational leaflet full of fun facts about our solar system. Decorate bedroom ceilings and walls. Use to accessorise your stuff such as books, bags and more. Allow exposure to natural light and watch them glow in the dark! Create a magical night sky on ceilings and walls or use to accessorise furniture and more! 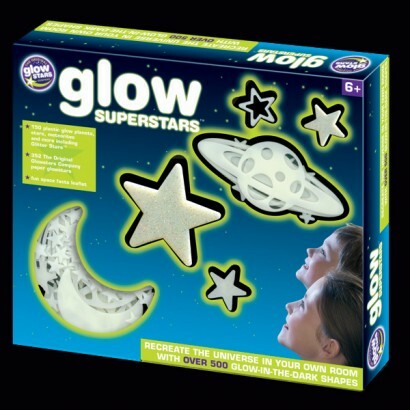 Find out more about how glow in the dark works to get the best from your glow superstars. Not that great the big pieces fall from the ceiling every other day even though I have used plenty of sticky stuff on it! Excellent product and speedy delivery.I was hugely satisfied by the straighforward ordering and delivery of this product and delighted by the quality of the product. Daughter loves them, good quality item, could do with more sticky tabs though. My children loved the glow in the dark stars and planets needed more sticky backs though to keep them held on the ceiling.